As Massachusetts infringes on speech, D.C. gets an illuminating visitor. Washington, D.C. — Finally, Pope Francis extends an olive branch to conservatives! Such was the gist of ridiculous headlines (Reuters: “Pope, in nod to conservatives, calls abortion ‘horrific’”) and analysis in response to this pontiff’s first annual address to the Vatican diplomatic corps. Pope Francis happened to point out, you see, that he’s opposed to abortion. “It is frightful even to think there are children, victims of abortion, who will never see the light of day,” the pope said. Rather than a mere checking of a box on a political scorecard — as if he were a candidate preparing for the primaries — he was simply reiterating Church teaching. In the unborn child is the face of Christ, he said on another occasion. Forty-one years after the Supreme Court’s January 22, 1973, ruling in Roe v. Wade, we ought to weep for the lives lost, weep for the pain, and resolve to do better to help build a culture of life — an alternative reality embracing the love that we owe one another as the loved children of a generous Creator. Mrs. McCullen is disarming in the same kind of way Francis is. While she clearly knows what she believes, she’s welcoming – it’s near-impossible for people to respond to her in the routine ideological way of Washington. Radiating love, she is challenging. What am I doing to help mothers and fathers and families and life? It’s hard not to ask the question while around her. As Justice Antonin Scalia pointed out time and again during oral argument, hers is not a protest case. While the law that imposes the buffer zone outside of abortion clinics in the Bay State is supposedly designed to stop women from being harassed or intimidated, Mrs. McCullen stands outside Planned Parenthood in Boston simply to propose life in the most practical terms. She offers help, hope, and love. If you’re a woman who has made up her mind, and you have no interest in a stranger’s assistance, she will not try to force you to listen to her. But if you’re a struggling mother walking toward the clinic hoping for a sign to turn around, she may just be it. Mrs. McCullen will walk with you. She’ll drive you for a sonogram, she’ll drive you to get food and diapers, she’ll stay with you. She’s in it with you for the long term, if you want her to be, helping you be a parent and love your family. She wants to walk with you. But the law limits her. “This law impedes my work,” McCullen told press gathered on the Supreme Court steps after the hearing. As Justice Samuel Alito pointed out during oral argument, a clinic worker can say, “Good morning. This is a safe facility,” within the buffer zone. Massachusetts argued that this is as it should be, because it doesn’t count as speech but as part of the conditions of the worker’s employment. Mrs. McCullen cannot, however, in the same space, say, “Good morning. This is not a safe facility.” As Alito put it, the only difference is a difference in viewpoint. Mrs. McCullen also cannot offer a solution in that space. In a culture that veils such a grave, irreversible decision in the rhetoric of choice and health, this is not simply a matter of Mrs. McCullen’s free-speech rights, but also of a woman’s chance to make an informed choice. Jarring, if you think about it. Giving, and yet telling women that ending the lives of their children is somehow empowering. That’s the reality of Eleanor McCullen’s life. She expresses empathy when talking with women who are trying to rise to their new and often unexpected motherhood. She never pretends it’s easy, but she lets them know they are not alone. “Everything worthwhile is worth fighting for,” McCullen insists, standing outside the Court. Surely life itself qualifies. McCullen does this work because in the unborn child she, like the pope, sees the face of Christ. As Mrs. McCullen walks with anyone who is willing, this is her reality — a Trinitarian reality where she knows each and every human being, even if unborn or disabled or aged, is loved by a Creator who redeems suffering and offers constant counsel. She meets real human needs as she sees people’s challenges and burdens with the light of faith. Her heart bleeds with love for the lonely and the desperate, for the struggling mother who is scared and doesn’t know where to go for support. That’s not liberal or conservative; it’s just a most tender and compassionate presence. Eleanor McCullen is a countercultural witness who encounters her brothers and sisters with the love of the illuminating light of faith. The Massachusetts buffer zone is not the American way — and that’s a bipartisan position, with briefs filed on Mrs. McCullen’s side of the argument by the AFL-CIO as well as pro-life groups like the Bioethics Defense Fund — but it is the occasion for some supreme enlightenment about the radical demands of love that our politics has been known to suppress and impede. 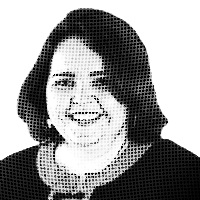 — Kathryn Jean Lopez is editor-at-large of National Review Online, a director of Catholic Voices USA, and a graduate of the Catholic University of America. This column is based on one available exclusively through Andrews McMeel Universal’s Newspaper Enterprise Association. A correction has been made since posting.